Haldirams Kaju Katli 250 Gms. and Dry Fruits (Cashew,Apricot ( Khurmani),Raisins ( Kishmish ) and almonds) 250 Gms. Send this Diwali Gift Anywhere in India. This special Diwali Gift will make your loved ones feel happy . Haldirams Kaju Katli 500 Gms. 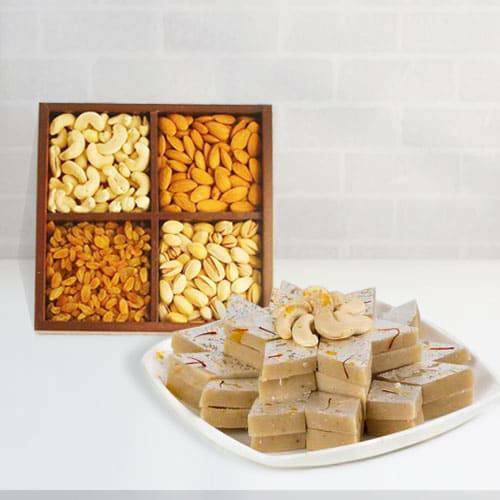 and Dry Fruits (Cashew,Apricot ( Khurmani),Raisins ( Kishmish ) and almonds) 500 Gms . Send this Diwali Gift Anywhere in India. This special Diwali Gift will make your loved ones feel happy . Haldirams Kaju Katli 1000 Gms. and Dry Fruits (Cashew,Apricot ( Khurmani),Raisins ( Kishmish ) and almonds) 1000 Gms. Send this Diwali Gift Anywhere in India. This special Diwali Gift will make your loved ones feel happy .